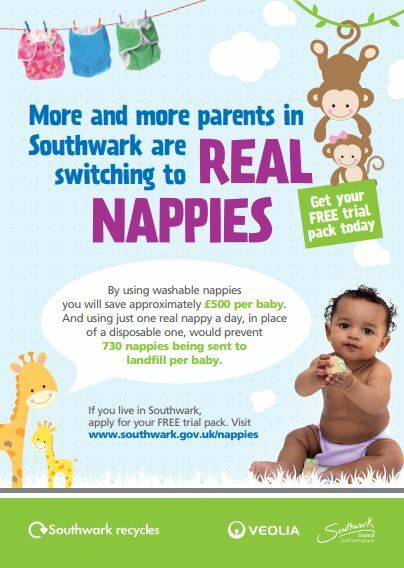 Orders of real nappy packs, through the Southwark Council scheme run in partnership with Veolia Southwark, have increased 72% over the last three years as Southwark parents take positive steps to reduce their waste and impact on the environment. To celebrate Real Nappy Week, local parents are invited to continue this trend by attending live demos to learn about real nappies, and how they can claim their FREE trial pack worth £50. Parents or soon to be parents, who live in Southwark, are invited to attend the demonstrations to find out more about the benefits of reusable nappies. For example, using just one real nappy a day, in place of a disposable one, would prevent 730 nappies ending up as waste. Using cloth nappies not only cuts down on household waste, helping to protect the environment but helps to save families money too. Through reusable nappies, parents can save approximately £500 per baby and if nappies are used for more than one child, the cost savings add up considerably. In the UK, 8 million disposable nappies are thrown away, every day. The plastic in disposable nappies means that they can take up to 500 years to break down. Parents across Southwark have been helping to reduce the number of nappies that are thrown away by making the switch to reusable nappies. In 2018, over 290 Southwark parents took advantage of Veolia Southwark’s free real nappy pack. The pack, which is worth £50, includes a selection of nappies for parents to try. To promote the giveaway and celebrate Real Nappy Week (22-27 April), Veolia Southwark will be hosting real nappy demonstrations at local library baby and toddler sessions (see listing below). The team will also be on hand to answer questions about using real nappies and how to apply for a free trial pack. Parents who are unable to attend can find out more and apply for a free nappy pack by filling in an online form at www.southwark.gov.uk/nappies.